426 pages, English language version copyright ©2004 MPI. All international distribution rights reserved. Some researchers spend a lifetime working towards the understanding of a specific complex problem and, as the culmination of their career, write a technical work offering such a profound and multilevel insight that it could not have been produced in any other way. Our contemporary lifestyle imposes enormous barriers against creating such life-career books, yet this is one. 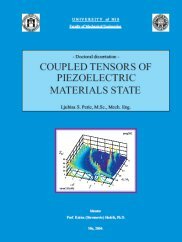 This extraordinary book provides incomparable understanding of piezoelectric materials and their behavior in electro-acoustic transducers. Dr. Peric's book is available in English exclusively from MPI. To order the book, please use our online store, or read more here. €40 off any 2 books! €90 off all 3 books! 240 pages, Copyright ©2004 MPI. All international distribution rights reserved. 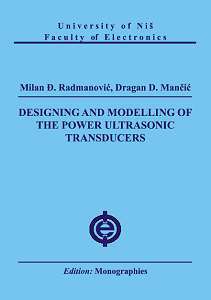 If you are interested in more information about MMM technology (multi-frequency systems) and all modern methodology regarding the manufacture and assembly of High Power Ultrasonic Converters, this comprehensive book on the technology of ultrasonic transducer / converter design and mathematical modelling is available to download. This book provides a comprehensive description of the technology and practical know-how regarding High Power Piezoelectric Converters: their assembly, quality measurements and characterization (power, efficiency, impedance matching etc). To order the book, please use the PayPal link below, or download a preview here. 198 pages, Copyright ©2004 MPI. All international distribution rights reserved. New Covering one-dimensional and three-dimensional mathematical modelling of cylindrical sections (sonotrodes and rings) and Langevin-type piezoelectric sandwich transducers, this book provides the detailed information required for accurate models. To order the book, please use the PayPal link below, or download a preview here. MPI is at the forefront of several new developments in power ultrasonics technology. These articles showcase some of this work. Many power ultrasonics applications use the piezoelectric sandwich type ultrasonic transducer, but few people understand the importance of an accurate analytical model of this system to ensure optimum performance. This transducer analysis provides a good basis for that understanding. 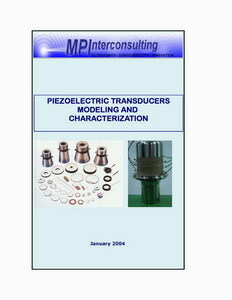 Please see the example chapters on this web site, and if you want much more detail you can order the book: Piezoelectric Transducers Modeling and Characterization. To order please use the PayPal payment link found on the bottom of this page. This level of understanding led to the development of a new type of transducer, now patented by MPI. The hammer-transducer page explains the principles, or you can view the published patent at Delphion. We have a pdf file of Hammer transducer animations (requires Acrobat Reader version 6 - free download from Adobe). Another radical new development is the use of multi-frequency ultrasonic systems in ultrasonic cleaning and sonochemistry (patent pending). View an article on the use of this technique for ultrasonic cleaning in liquid supercritical CO2, written by MPI and partner company ECO2 SA, for the 2001 Ultrasonic Industrial Association Symposium.